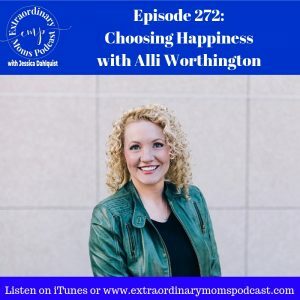 Today my guest is Alli Worthington. Alli is releasing a new book centered around the topic of happiness, so today we are chatting about her motherhood journey, how happiness has evolved over the years, and how she endured challenging times (like homelessness) with hope and perspective. She’s wise and fun and funny. You’re going to love this conversation! You know when I’ve been loving on my busiest weeks? Hello Fresh! Hello Fresh allows you to select healthy meals for your family, the pre-measured ingredients are delivered straight to your door, and you have step by step ingredients to make putting dinner on the table simple and fun! I’d love for you to give Hello Fresh a try. For $40 off your first box (making it $20 for your first week of three meals) go to Hellofresh.com and use my code: JESSICADAH. Let me know how you like it!